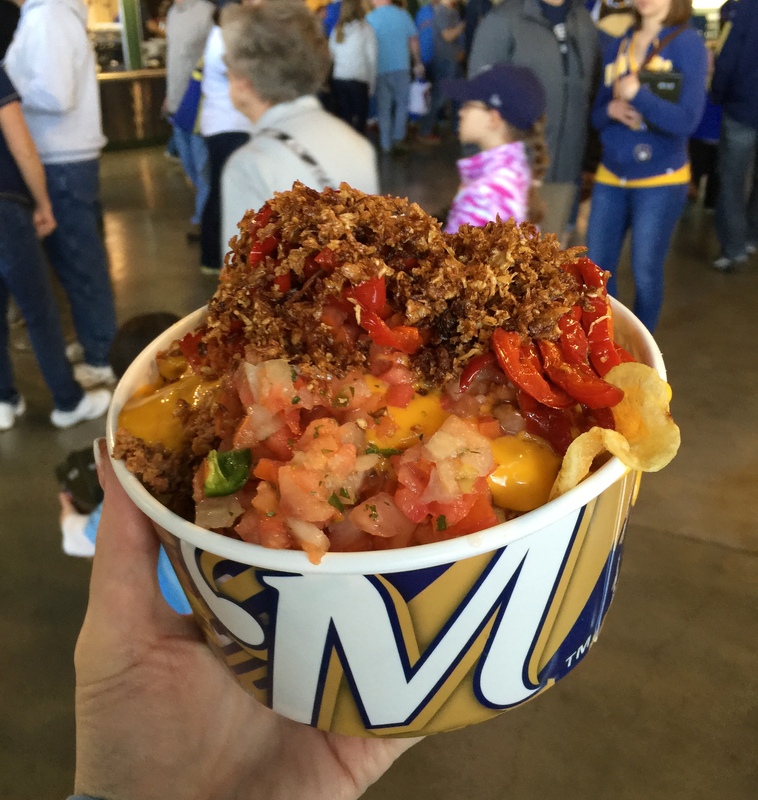 We went to Miller Park yesterday to give the new eats a try as well as to see the Brewers lose their fifth game in six tries; lets hope they right this ship. Oh well, at least we got a rocket-of-a -Gomez home run to watch sail into the stands, as well as tasting some decent new ballpark treats. Flavorful taco meat in the middle with a Dorito crust on the outside, with a lengthy squiggle of cheese and sour cream. 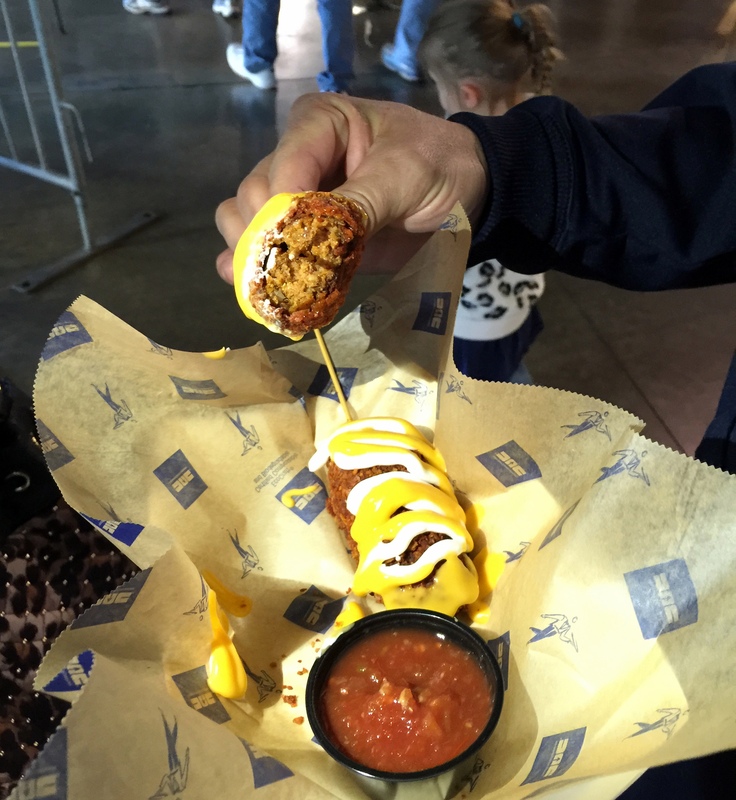 The Nachos on a Stick had good flavor, wasn’t dry and certainly gets points for being easy to eat when sitting in a cramped ballpark seat or just walking around the park. 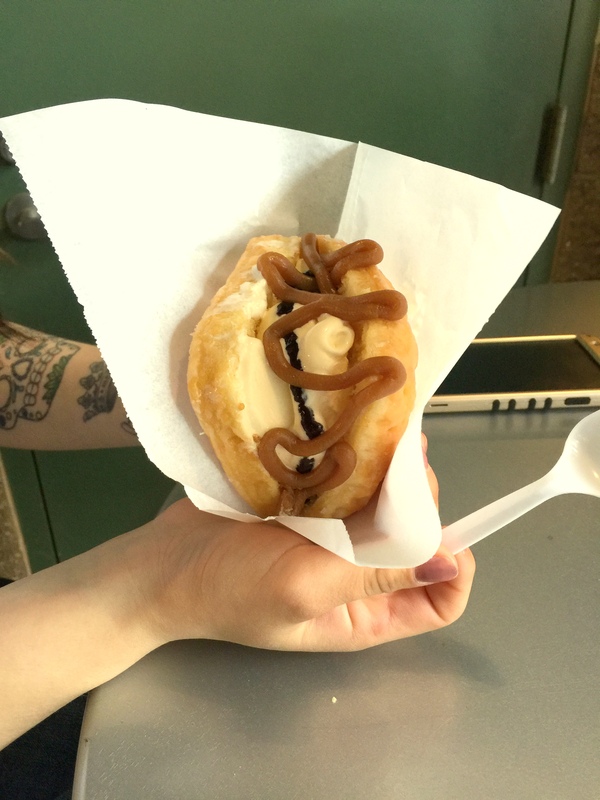 Take a Holey Moley doughnut, stuff it with custard and add some peanut butter and blueberry preserves and eat all you can, immediately. You definitely get your money’s worth, so plan to eat with a friend. I wouldn’t let my kid try to tackle one of these; its a little messy, but definitely tasty. It would be nice to have a mini-ice cream sandwich offering as its not the kind of leftovers you can easily dispose of as you are sitting in the stands. 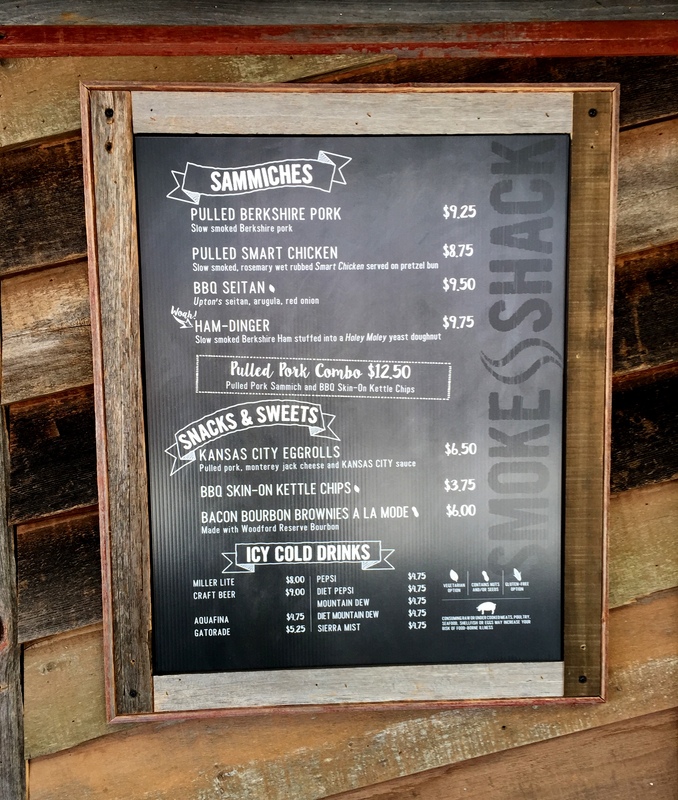 The Smoke Shack (base location in Milwaukee’s Third Ward) has a new stand on the 100 level, directly next to AJ Bombers. 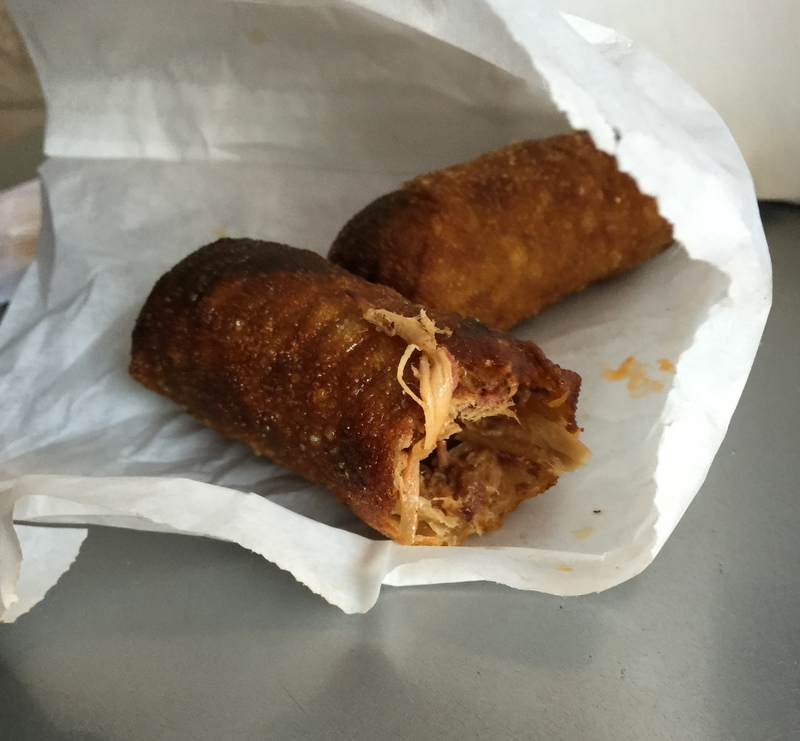 We tried the Kansas City Eggrolls which were egg rolls stuffed with pulled pork and cheese. These were not very photogenic but the taste was great. CAUTION, do not ruin your clothes – when you bite into the egg roll some of the pulled pork liquid will squirt out, so be prepared. Two larger-sized egg rolls for $6.50 seemed a fair price. I could see maybe a BBQ ranch sauce as a side with these. The pulled pork was really good and next game I am going to try one or two other items off their menu. I understand Seitan is a veggie item and I heard a couple fans squeal with delight when they saw that on the menu. When we were walking around with the Bratchos, fans were almost visibly salivating, and at least three people asked us where we bought these in the park. Each ingredient was inventive and tasty on its own, the problem was when you put them all together, it was SUPER SALTY. If you are expecting slices of brats, that’s not the concept. The menu shows that the bratchos are topped with four different sausages including brats and chorizo which are then ground into a Taco Bell meat like consistency. It tastes fine, just not what I expected. The brown crumbly stuff is basically like dehydrated/roasted onion crumbles which were inventive and good. The pickled, dehydrated red peppers seemed to be the main source of the saltiness, next time I would ask for only a few red peppers. The cheese is a movie-nacho cheese sauce, but a slightly thicker version, as well as a large spoonful of pico de gallo. This is all resting on potato chips. Listen, I know when you look at this picture, you will be compelled to order the Bratchos. Be prepared for the saltiness though. Also, get forks. And napkins… Lots and lots of napkins. By the time we got to the street tacos, we were almost full but had try it when we saw the meat and the veggies on the grill. 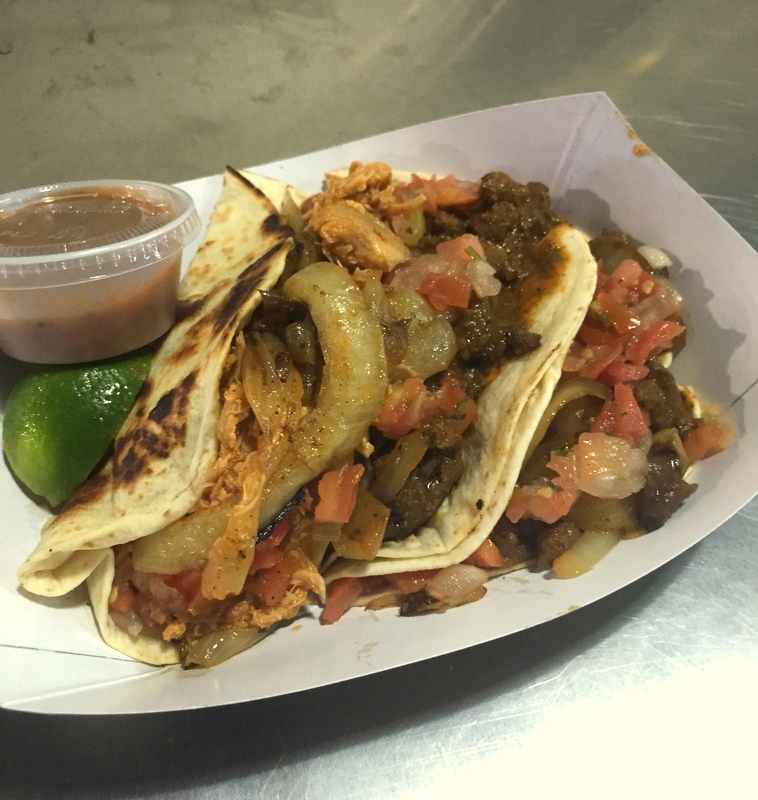 For $12, you get three tacos, your choice of chicken, beef, or a combo of both. The taco seller STUFFED the meat into the toasted flour tortillas, basically overfilling them. Again, you must have a friend to help you because this was a lot of taco. The meat was fine but tasted like slow cooker Mexican chicken and slow cooker beef with too much cumin for my liking. Also, when I hear the word “street taco” I think corn tortilla, maybe dressed with cilantro, lettuce and onion. I really like corn tortillas so the flour tortilla, although nicely toasted, was a let down. At $12, the price is a little too hefty to take a chance on not liking this item. It’s supposed to be an 18-inch brat covered with gravy, French fries, cheese curds, cheese sauce, fried sauerkraut and jalapeños, then topped with sour cream and chives . Problem is we couldn’t find this anywhere within the park, even after asking three employees. Not sure how successful a $20 brat will be for the average ballpark fan, maybe that was why it was hidden or not available. 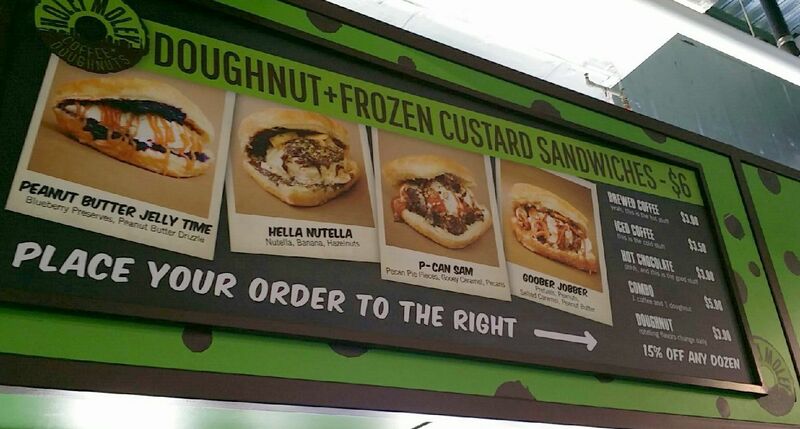 After reading articles from baseball park food experts, it seems clear that Milwaukee has some of the best stadium food offerings in the MLB. I still love the classic brat with stadium sauce and next time, that is first up in the batters box for me.